1: Still tossing around the Taylor-for-Lee swap in my head. The question “do you like the trade?” seems woefully inadequate, or at least, I’m conflicted in how I’d answer. I think that Chris Taylor’s not ready to play in the big leagues for the M’s – he showed that last year, and he showed it in his brief call-up. Everything we’ve seen from him in AAA says the opposite: that while he’s not going to be a star, he could add some value. There’s a huge chasm between those two piles of evidence, and for whatever reason, the M’s haven’t been all that interested in helping Taylor bridge it. If that’s where the M’s found themselves – with a player who simply didn’t fit into their long term plans thanks to the likes of Luis Sardinas and Steve O’Malley, then the M’s were right to move Taylor for the shiniest bauble they could find. Lee’s so interesting because it seems like he’s got a similar issue to Taylor, where you see some ability and some flashes of real MLB-ready talent, but it’s lost in inconsistency and stalled growth. Even if Lee hears the same thing from his new pitching coaches (and Tacoma’s Lance Painter is an excellent one), it’s probably worth hearing it from a different voice. I like the deal, and I’m still bewildered and maybe a bit miffed that it had to be made. But because it so obviously did, hey, Lee’s a better lottery ticket than many stalled-out prospects can fetch. Gaahh! Damn it, Texas. The M’s are 3-7 in their last ten ball games, while the Rangers have gone 8-2 and opened up the second-biggest divisional lead in baseball, after the Cubs scorched earth policy in the NL Central. The division is rapidly becoming a runaway win for the Rangers, which makes this series against an AL Central team all the more important. Losing 2 of 3 in Boston to *that* team certainly didn’t feel good, and the M’s had so many chances to do more, but it’s an understandable series loss. But if you’re going to allow yourself some room for error when playing very good teams, you need to take care of business in winnable games. That’s what the M’s haven’t done of late, and it’s what they desperately need to do now. 3: Former Mets/Twins starter Mike Pelfrey played 3 seasons for Minnesota, logging 341 IP with an ERA right around 5. A groundballer without extreme GB rates, he’s notable mostly for his pitch-to-contact approach. While his FIP numbers were a bit better thanks to his avoidance of home runs, he was injury-plagued and not terribly successful at preventing runs for the Twins. Pelfrey signed a two-year, $16 million deal with Detroit this off-season, a deal that was roundly mocked by internetting commenters, and also held up as a sign of just how bonkers the market for starting pitching had become. For everyone unhappy with the return in the Carson Smith trade, Pelfrey’s deal at least gave you pause. Is pitching just worth more than we thought? Or were the Tigers insane? I suppose that question’s still up in the air, as Pelfrey’s been reliably bad, just in different ways. The HR luck he had didn’t make it across state lines, so Pelfrey now has an above-average HR rate to go with an awful K:BB ratio. This makes his FIP abysmal, but he’s stranded some runners, so his ERA is only bad as opposed to awful. He was paid for something like 1 WAR per season, and he’s going to have to work pretty hard in the 2nd half to get there, but at the same time, he’s given them a bunch of not-awful innings, and maybe they saw value in that. The guy he sort-of replaced in Detroit’s rotation, Alfredo Simon, has an ERA of 9.45 and a FIP of 7.20 in 11 starts, and has a lingering shoulder issue. That shouldn’t matter to how they value Pelfrey, but I can imagine someone in the Tigers FO thinking that things have generally worked out. 4: As a sinkerballer with a slider as his primary breaker, Pelfrey is clearly vulnerable against left-handed hitters. He’s tried to combat this with a splitter, a pitch he throws a lot to lefties. It’s got good sink to it, and it’s somewhat effective overall, but it’s not a real outpitch the way Hisashi Iwakuma’s is. 5: The Arizona Rookie League starts up today, so we’ll have another league with a bunch of new draft picks to follow. Thomas Burrows, the 4th round pick, appears on the roster, though MLB’s signing tracker hasn’t seen him sign yet. I assume he has, and that Donnie Walton’s the last of the top 10 round guys still unsigned. All told, the M’s didn’t save a ton of money, thanks to 2nd rounder Joe Rizzo going about $500,000 over slot. They signed him, and they made up most of that amount with their 6th-9th rounders, but I don’t think there’s a ton left over to take a run at the 32-35th round high-ceiling high schoolers. We’ll see, though. Donn Roach tossed 8 shutout IP in Tacoma’s extra-inning 1-0 win over Fresno. Adrian Sampson’s been more consistent, but Roach has really come on after a disastrous April. He’s not the ground ball phenom he’s been in the past, but he’s on quite a roll in Tacoma’s rotation. Cody Martin starts for Tacoma tonight at Cheney Stadium. Gareth Morgan got a few games for Jackson before he suits up for Arizona now that the complex league opens, and he knocked 3 doubles in 2 games – Jackson won last night to get a franchise-record 46 wins in a half-season. Morgan also K’d six times in 10 PAs, so there’s still a ways to go, but three XBHs in 2 games is great to see from the young Canuck. Chantz Mack had 5 hits, 5 RBIs and hit for the cycle last night in Bakersfield’s 12-2 win. Ljay Newsome, an interesting HS pitcher out of Maryland the M’s signed in the 2015 draft, makes his short-season debut tonight. Nice to see a little competent bullpen work there from Benoit in the 8th. It would of been nice if Cano and Cruz could of helped out a little bit today…maybe we could of been going for the save here instead of just a tie. Well, I figured the Ms would score and they would bring in Cishek. I’m not sure that inning rose to the level of “competent,” but it’ll do! Its really disheartening to see next to no production from our highest paid guys in games like this, when every other player has multiple hits. I just wanna win 🙁 is that so much to ask for! Cruz played right into that strategy. Crap. Way to be clutch there Mr. Cruz! Just lose already get it over with, that was pathetic as all hell. How many leadoff doubles do we need to get a run in? Leadoff another inning with a double…. and do nothing… that’s not even close to winning style baseball. For some reason, I hate Guti. Way to hustle down the line. Garbage… how do you lose a game like that! This has quickly gone right back to the 2015/14/13/12/11/10 mariners in a damn hurry. It’s such a shame to, had such high hopes. Lets hope someone gets some fire under their asses soon and turns it around before its too late. 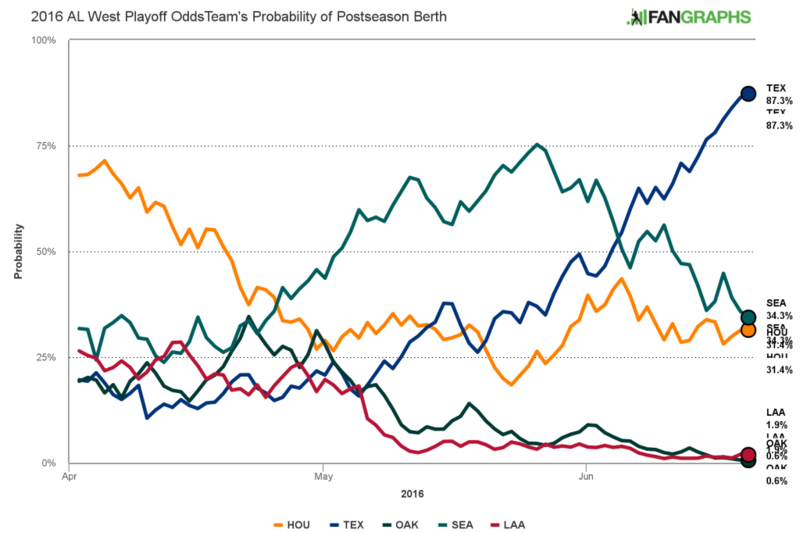 The Ms have a better run differential than the Rangers, but they are nine games behind, and they have lost their last 7 one-run games. Something is just screwed up here. Something is just screwed up here. They’re unlucky and hitting the sort of bad patch that’s not unusual for even good teams?